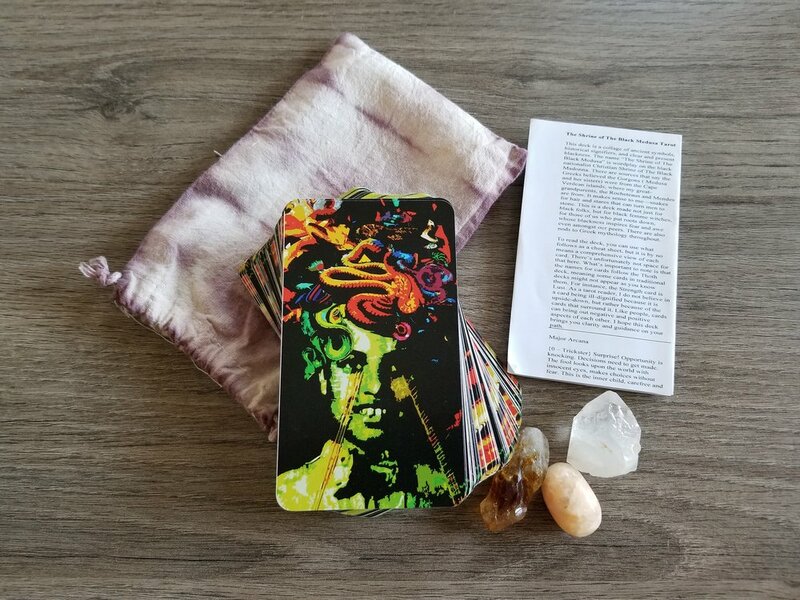 The Shrine of the Black Medusa Tarot is a stunning tarot deck created by Casey Rocheteau. I spotted it back in 2016 while it was fundraising on Indiegogo under the subheading “Tarot Cards for the People”. I was stunned to see this even being conceived – a deck created with Black queer magic as central to its inception? Where they do that at? Let’s start with the title Shrine of the Black Medusa. As a Black girl who came up in love with and entranced with the story of the Gorgon sisters – and more than that always pictured them as Black women, dreadlocks swinging fierce and snakelike – this title was everything. That the deck, and our reading with it, would create space for us to bring ourselves before the Shrine of these incredible Black sisters felt like a lifelong affirmation I’d been waiting for. > Read the full review and preview more cards at the Little Red Tarot blog over here. > And check out my interview with the creator, Casey Rocheteau!